Certain dishes are eaten during the Chinese New Year for their symbolic meaning. 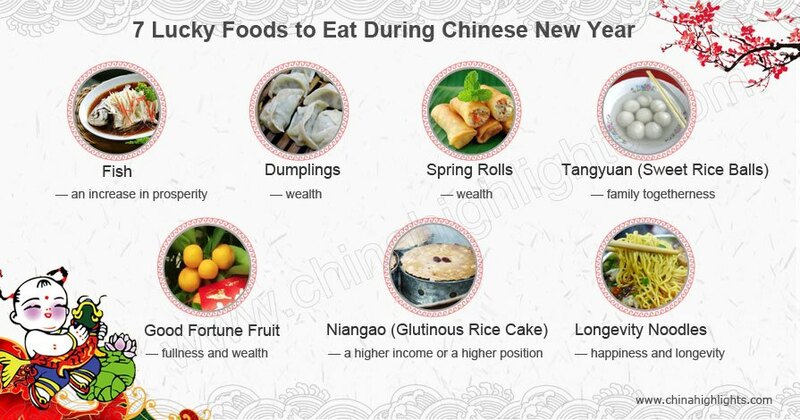 Lucky food is served during the 16-day festival season, especially New Year&apos;s Eve, which is believed to bring good luck for the coming year. 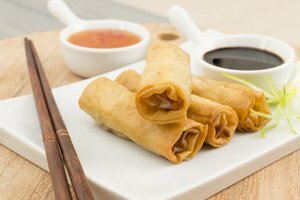 The most common Chinese New Year foods includes dumplings, fish, spring rolls, and niangao. We&apos;ve rounded up 7 essential Chinese, or Lunar, New Year dishes, and included the symbolism behind them all. In Chinese, "fish" (鱼 Yú /yoo/) sounds like &apos;surplus&apos;. Fish is a tradtional Chinese New Year dish. Chinese people always like to have a surplus at the end of the year, because they think if they have managed to save something at the end of the year, then they can make more in the next year. Crucian carp: As the first character of &apos;crucian carp&apos; (鲫鱼 jìyú /jee-yoo/) sounds like the Chinese word 吉 (jí /jee/ &apos;good luck&apos;), eating crucian carp is considered to bring good luck for the next year. Catfish: The Chinese for "catfish" (鲶鱼 niányú /nyen-yoo/) sounds like 年余 (nián yú) meaning &apos;year surplus&apos;. So eating catfish is a wish for a surplus in the year. Eating two fish, one on New Year&apos;s Eve and one on New Year&apos;s Day, (if written in a certain way) sounds like a wish for a surplus year-after-year. If only one catfish is eaten, eating the upper part of the fish on New Year&apos;s Eve and the remainder on the first day of the new year can be spoken with the same homophonic meaning. Fish is an auspicious Chinese New Year symbol. The fish should be the last dish left with some left over, as this has auspicious homophonics for there being surpluses every year. This is practiced north of the Yangtze River, but in other areas the head and tail of the fish shouldn&apos;t be eaten until the beginning of the year, which expresses the hope that the year will start and finish with surplus. There are some rules related to the position of the fish. The head should be placed toward distinguished guests or elders, representing respect. Diners can enjoy the fish only after the one who faces the fish head eats first. The fish shouldn&apos;t be moved. The two people who face the head and tail of fish should drink together, as this is considered to have a lucky meaning. 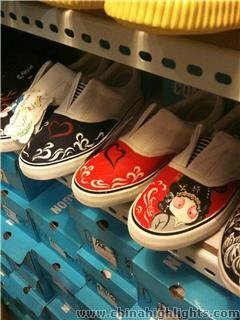 These customs are observed in a lively and light-hearted spirit, full of laughing and banter. Fish can be cooked in various ways such as boiling, steaming, and braising. 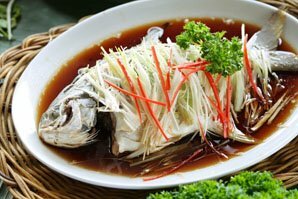 The most famous Chinese fish dishes include steamed weever, West Lake fish with pickled cabbage and chili, steamed fish in vinegar sauce, and boiled fish with spicy broth. 年年有余 (Niánnián yǒu yú /nyen-nyen yo yoo/): May you always have more than you need! 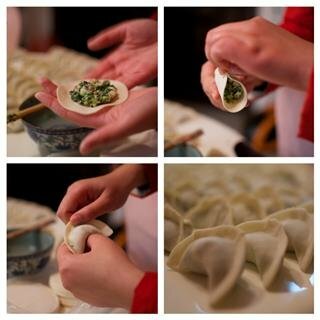 With a history of more than 1,800 years, dumplings (饺子 Jiǎozi /jyaoww-dzrr/) are a classic Chinese food, and a traditional dish eaten on Chinese New Year&apos;s Eve, widely popular in China, especially in North China. How they&apos;re made: Almost all Chinese people can make dumplings. 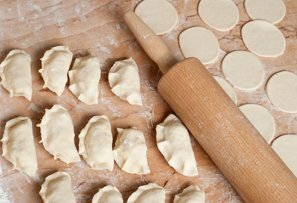 First they mix the dough, second make the dough into round "wrappers" with a rolling pin, third fill the wrappers with stuffing, fourth pinch the "wrapper" together into the desired shape, and fifth cook them. 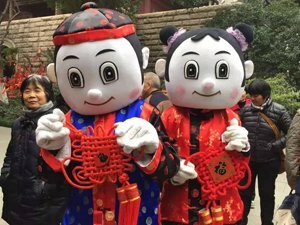 Chinese don&apos;t eat Chinese sauerkraut (酸菜 suāncài /swann-tseye/) dumplings at Spring Festival, because it implies a poor and difficult future. On New Year&apos;s Eve it is a tradition to eat dumplings with cabbage and radish, implying that one&apos;s skin will become fair and one&apos;s mood will become gentle. Dumplings should be arranged in lines instead of circles, because circles of dumplings are supposed to mean one&apos;s life will go round in circles, never going anywhere. 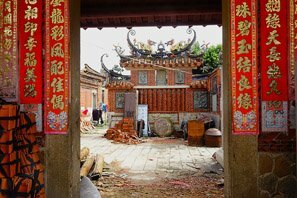 Zhāo cái jìn bǎo (招财进宝/jaoww tseye jin baoww/): &apos;Bringing in wealth and treasure&apos; — a felicitous wish for making money and amassing a fortune. 黄金万两 (hwung-jin wan-lyang/): &apos;A ton of gold&apos; (because fried spring rolls look like gold bars) — a wish for prosperity. Glutinous rice cake (年糕 Niángāo /nyen-gaoww/) is a traditional Chinese New Year recipe. In Chinese, glutinous rice cake sounds like it means "&apos;getting higher year-on- by year"&apos;. In Chinese people&apos;s minds, this means the higher you are the more prosperous your business is a general improvement in life. 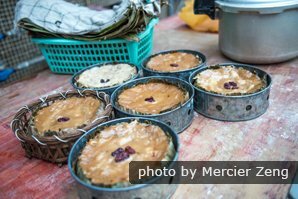 The main ingredients of niangao are sticky rice, sugar, chestnuts, Chinese dates, and lotus leaves. 年年高 (niánnián gāo /nyen-nyen gaoww/): &apos;Getting higher year-after-year by year&apos;, can imply children&apos;s height, rise in business success, better grades in study, promotions at work, etc. Sweet rice ball (汤圆 Tāngyuán /tung-ywen/) is the main food for China&apos;s Lantern Festival, however, in south China, people eat them throughout the Spring Festival. 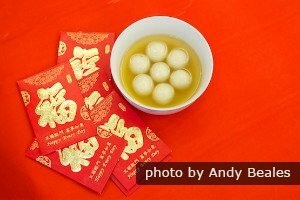 The pronunciation and round shape of tangyuan are associated with reunion and being together. 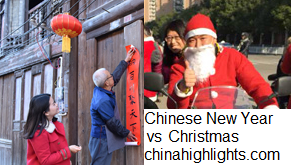 That&apos;s why they are favored by the Chinese during the New Year celebrations. 团团圆圆 (Tuántuán yuányuán /twann-twann ywen-ywen/ &apos;group-group round-round&apos;): Happy (family) reunion! 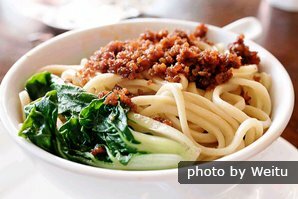 Longevity noodles (长寿面 Chángshòu Miàn /chung-show myen/) unsurprisingly symbolize a wish for longevity. Their length and unsevered preparation are also symbolic of the eater&apos;s life. Eating and displaying tangerines and oranges is believed to bring good luck and fortune due to their pronunciation, and even writing. The Chinese for orange (and tangerine) is 橙 (chéng /chnng/), which sounds the same as the Chinese for &apos;success&apos; (成). One of the ways of writing tangerine (桔 jú /jyoo/) contains the Chinese character for luck (吉 jí /jee/). Eating pomeloes/shaddocks is thought to bring continuous prosperity. The more you eat, the more wealth it will bring, as the traditional saying goes. 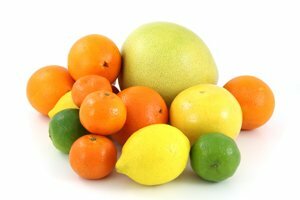 The Chinese for pomelo (柚 yòu /yo/) sounds like &apos;to have&apos; (有 yǒu), except for the tone, and exactly like &apos;again&apos; (又 yòu).